In the words of Peg from Peg + Cat: We’ve got a BIG Problem. We moved into our new construction house last November a week before we had our baby boy. I like the house just fine, but the colors aren’t really me. So, last month I painted the walls, changing the drab contractor grade taupe that is on the walls of what seems like every house these days. I went with a cream color for most of the house but chose a light gray for my office/extra bedroom and dining room. I will probably choose the same light gray for our baby’s room and maybe even our bedroom. I haven’t gotten around to those rooms yet. 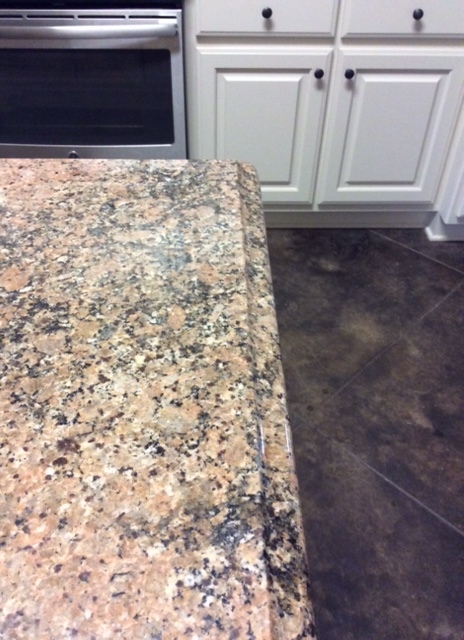 Anyway, I detest the color of the granite the contractor chose for the entire house. This gives you an idea. Counter Material. With all due respect to anyone who likes it, I kind of hate it. I’m more of a carrerra or statuary marble kind of gall; I adore white and light gray marble and granite. This is what the island looks like currently that beige-cream color is on all the cabinets and trim. It looks ok here, but I promise it has an almost beige element to it. Why can’t contractors use lighter colors. What happened to classic white cabinets?! 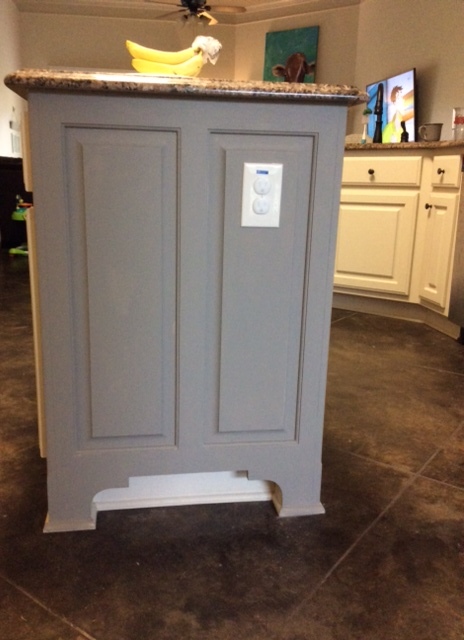 Here is one side of the island with 3 coats of Annie Sloan chalk paint on it; I thought this was going to be the way to go, but it was a major fail. This brings us to this picture of the two samples I’m considering. The color on the left is Benjamin Moore’s Kendall Charcoal and the color on the right is Iron Ore by Sherwin Williams. I like the Iron Ore better but I’m afraid it will be too dark with our dark stained concrete floors. 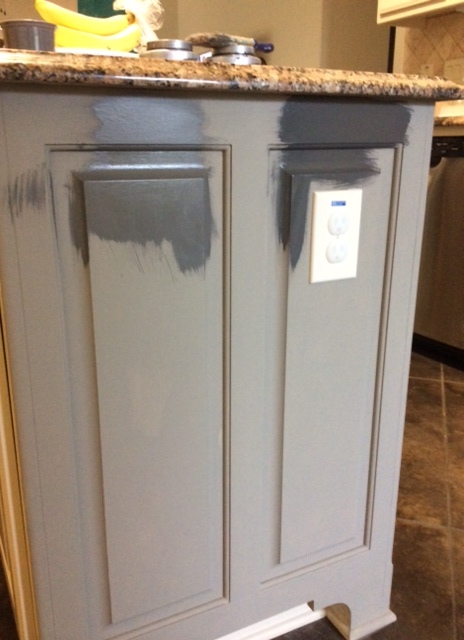 This should be pretty simple, I’ve painted cabinets before. The problem is that they used oil based paint on all our trim and cabinetry. I’ve never worked with oil based paint before. I’m not sure which process to use to get this island painted. Do I sand it and prime it with oil based primer and then paint with latex paint? I read a blog on Pinterest that suggested doing that and their cabinets looked great. More to come with the Island Problem! This entry was posted in House & DIY and tagged cabinets, island, kitchen, paint on August 11, 2014 by wisemaliha. Hi there! I'm Maliha. 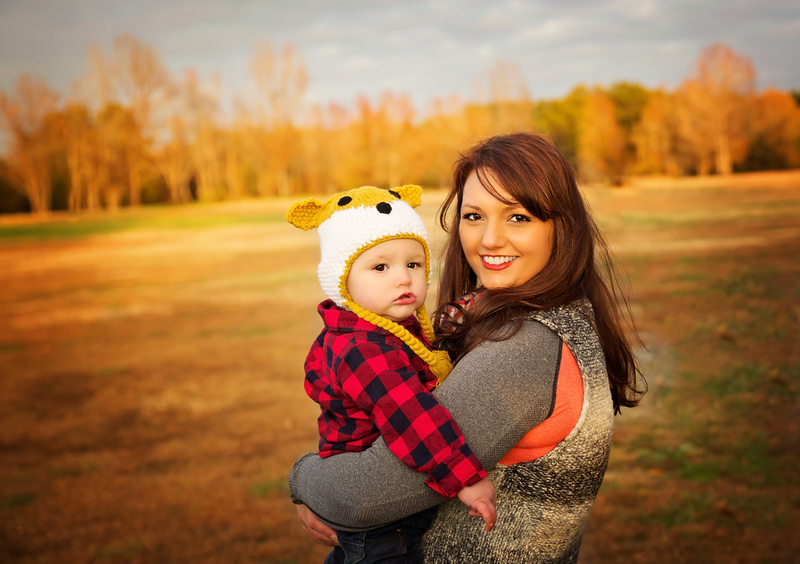 Proud Air Force wife and mother to an amazing 1 year old son and golden retriever puppy brother. Welcome to my blog where I share DIYs, Fitness talk, Financial fun, and anything else that floats my boat.